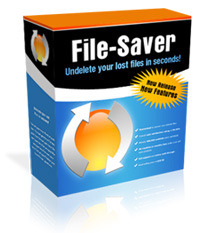 "The World's Most Powerful File Recovery Software..."
RECOVER your DELETED FILES - In Just Seconds! Need to URGENTLY recover those deleted files, folders, or documents? Need to recover your accidentally deleted recycle bin? WE CAN HELP. 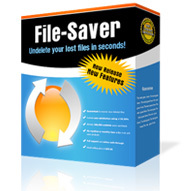 File-Saver is the world's smartest file recovery software. It can instantly restore hundreds of deleted files from your PC. It doesn't matter if you've emptied the Recycle Bin, or a computer virus deleted the files. recover photos and data . . . EVEN if you have formatted the card! SPECIAL OFFER: Order before midnight MONDAY for just $19.95! Bargain? Our rivals sell slower, less-functional undelete products and services costing between $39 and $1000. Check out Quetek at $40, R-TT at $149 and the popular Winternals at $499. We're the best of the crowd - which is why over 100,000 users worldwide use File-Saver! Corporate WCCL customers include the U.S. Army, Microsoft, AT&T, IBM, FedEx, British Telecom, UPS, Deloitte & Touche, Dow Jones, Merrill Lynch, the Discovery Channel, Time Warner, Nationwide Insurance, Xerox, and many more. Got a question? Read our Frequently Asked Questions or contact us. ANY drive on your computer - including camera cards! 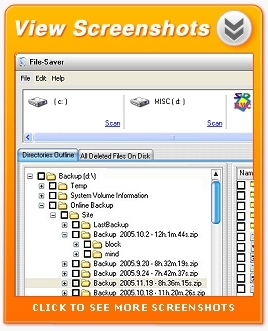 INTUITIVE Windows Explorer mode enables you to view your deleted files as though they were still available on your computer! RESTORE with folder structure feature enables you to restore entire folders, intact! FULL SUPPORT for any drive - including all FAT and NTFS drives, floppy disks, and digital camera cards! World's Most Powerful Undelete Tool GUARANTEED! We also offer a CD version of our undelete software. Click HERE to find out more. Home FAQ Screenshots Affiliates Contact Us BUY NOW!